TAMPA BAY, FL – Innisbrook, a Salamander Golf & Spa Resort, is preparing to roll out a luxurious and personalized welcome mat for Florida and South Carolina delegates attending this year’s Republican National Conference (RNC) in Tampa. 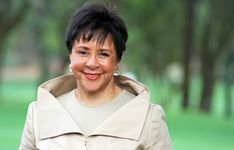 In fact, as she often does, owner Sheila C. Johnson plans to personally greet guests, including the delegations attending the August 27-30 event. On Monday, the RNC cited Innisbrook’s appeal for Florida and South Carolina delegates. The resort is only 20 miles northwest of Tampa International Airport and just 40 minutes from the Tampa Bay Times Forum – the convention site. Delegates staying at other properties, especially those at the beach, have a similar travel time. Located on 900 acres with four golf courses and 100,000 square feet of meeting and event space, the resort recently underwent a multi-million dollar renovation. It also features 11 tennis courts, six swimming pools, four restaurants and the luxurious Indaba Spa. Innisbrook also recently became part of Salamander’s Grand Golf Resorts of Florida – which features Reunion Resort in Orlando and Hammock Beach Resort in Palm Coast. Adding to the personal connection for the delegates, Johnson currently owns the Forbes Five Star and AAA Five Diamond Woodlands Inn near Charleston, SC, which is also managed by Salamander. Throughout the delegates’ stay, Innisbrook will be offering a variety of family activities, spa specials, and creative food and beverage offerings, including Grand Old Party themed fireside cookouts and an RNC Steak Spectacular. This 22-ounce premium cut of chef-selected beef will be served at Innisbrook’s premier steakhouse, Packard’s. The restaurant is named after golf course designer Larry Packard, who lives at the resort and is celebrating his 100th birthday in November. For more information about Innisbrook Resort, visit www.visitinnisbrook.com or call 727-942-2000. Operated by Salamander Hotels & Resorts – and part of the new Grand Golf Resorts of Florida collection – Innisbrook is situated on 900 wooded acres of rolling hills in the St. Petersburg/Clearwater area on Florida’s Gulf Coast, and is located just 25 minutes from Tampa International Airport. Recently and completely renovated, the resort features 72 holes of championship golf, 600 spacious guest suites and rooms, four restaurants and three bars, the Innisbrook Golf Institute, 11 tennis courts, the new luxury Indaba Spa with 12 treatment rooms and state-of-the-art Fitness Center, six heated swimming pool complexes, a nature preserve, and three conference halls with 65,000 square feet of indoor meeting space. The resort hosts the annual PGA TOUR Transitions Championship at its famed Copperhead Course, and the LPGA-supported Legends Tour Open Championship, held annually at the equally challenging Island Course. Innisbrook is a member of the prestigious Preferred Hotels & Resorts, and Preferred Golf Club programs. For additional information call 727.942.2000 or visit www.innisbrookgolfresort.com. Salamander Hotels & Resorts is a privately owned and operated company based in Middleburg, VA, just outside Washington, D.C. Founded by entrepreneur Sheila C. Johnson in 2005, the company has a portfolio that features the Grand Golf Resorts of Florida, a collection of three stellar golf resorts including the recently renovated Innisbrook Resort near Tampa, Reunion Resort in Orlando and the oceanfront Hammock Beach Resort in Palm Coast; Grand Resorts at Cap Cana, a collection of luxurious properties in the Dominican Republic including the oceanfront Sanctuary Cap Cana, the new marina-inspired Fishing Lodge Cap Cana, and the future Ocean Club Cap Cana; the Forbes Five-Star- and AAA Five Diamond-rated Woodlands Inn near Charleston, SC; and the eagerly anticipated Salamander Resort & Spa in Middleburg, a 340-acre equestrian-themed, ultra-luxury resort located near Washington, D.C. opening in 2013. For additional information, call (540) 687-3710 or visit www.salamanderhotels.com.